After three quarters of impressive growth, management is trying to keep the good times rolling. But will their efforts pay off for shareholders? 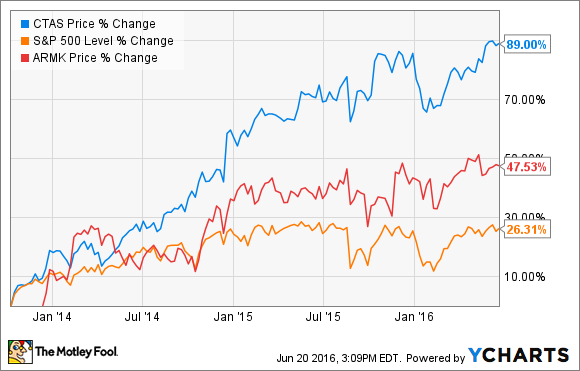 Any way you slice it, Cintas (NASDAQ:CTAS) is having a great year. The uniform rental and facilities services company has posted three straight quarters of solid top- and bottom-line growth and is predicting a sixth straight year of double-digit earnings growth. However, in order to maintain its top dog status in a competitive and fragmented industry, Cintas is shaking things up a bit. Here are two of the company's major initiatives and what to expect from them in the coming months and years. Cintas has been more than just a uniform renter for over a decade. The company offers a diverse array of services including first-aid kit restocking, restroom supply, and fire system maintenance. This diversification has helped the company maintain its impressive growth story over the years by contributing to its high margins and allowing it to generate more revenue from its existing customer base. In this manner, it's similar to competitor Aramark (NYSE:ARMK), which offers food service and facility cleaning services in addition to its uniform rentals. A good example of how this affects the company is the current state of the oil and gas industry. With fuel prices low, many energy companies are being hit hard. That's resulting in lower demand for uniforms from that sector to the tune of about 40 basis points, according to Cintas Vice President and Treasurer Paul Adler. However, Cintas actually comes out ahead, because the lower prices means it's spending about 50 basis points less on fuel for its fleet of vans. If Cintas had heavier exposure to the energy industry, this would have been a net negative instead of a net positive. Cintas has announced plans to generally broaden its offerings and its customer base, but it hasn't specified if that will involve introducing new services in addition to ramping up existing ones. As CFO Mike Hansen said in the company's recent Q3 earnings call, many potential customers don't realize how diverse Cintas' offerings actually are. "We've had many customers over the years say to us, 'Gosh, I didn't know you did that. I didn't know that you did first aid and safety. I didn't know that you had fire protection services. I didn't know you had chemical cleaning services,'" he said. "And the more we heard this, we kept thinking, 'We need to educate.'" So, the company has decided to educate potential customers by launching a national branding campaign using the tag line "Ready for the Workday." The campaign is expected to ramp up over the next several months and be fully operational by the second quarter of 2017. According to Hansen, it's the largest branding campaign the company has ever launched, and it will be the first to feature TV ads. Improving brand awareness nationally should help Cintas meet its goals of sustained growth. And Hansen thinks now is the perfect time to do just that. "Now is a great time to do this because we've got some businesses that are really doing well and executing well," he said. "We've got a lot of ... fairly new products and we want to get the word out to many, many businesses in North America that when those businesses have issues, need problems solved, think about calling Cintas." The company is being up front about the fact that -- as with most branding campaigns -- the full impact won't be able to be assessed for at least a year after its launch. But the company is wise to flex its financial muscles in this manner. In a fragmented industry full of smaller players for whom a national branding campaign isn't an option, getting the word out is a wise use of company resources. Luckily for shareholders, management isn't content with "more of the same"; it's planning additional efforts to diversify and attract new customers. True, there's no guarantee these efforts will pay off. The company's national "Ready for the Workday" branding campaign could flop, or fail to have the anticipated impact on the bottom line. New business lines could fail to perform as anticipated, like the company's recently divested document shredding service did. And economic trouble will always be a potential problem for even a well-diversified company like Cintas. However, the potential risks to a branding campaign and diversification are low compared to the potential positive impact, and it's good to see Cintas "making hay while the sun shines"; its business is strong. Investors should have confidence that the good times will keep rolling for the company.